David Archuleta on his OPM album: "I’m not prepared at all because it was something that just happened after I sang ’Nandito Ako.’ It happened in a small amount of time, from picking songs, to recording them." 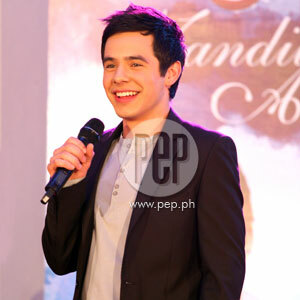 This afternoon, February 15, David Archuleta was present at the Kamia Room of Shangri-La Plaza Hotel for a press conference for Forevermore. Forevermore, produced by Ivory and Sony Music, is the foreign artist’s newest album. It will contain OPM songs rendered by David in his powerful young voice. David has been in the Philippines for almost a month, after he agreed to shoot a mini-series for TV5. And now that the taping of Nandito Ako, the title of the series, is finished, David will leave the country in a few days. Answering the questions of the press, the American Idol Season 7 runner-up revealed that the decision to record an OPM album was not planned. "It happened in a small amount of time, from picking songs, to recording them," he said. David mentioned that the producers of his album liked his rendition very much of the classic Filipino song "Nandito Ako" for his mini-series that they conceptualized a new album for him. But unlike "Nandito Ako," composed and originally recorded by Ogie Alcasid, David did not have a hard time learning the Filipino language because he recorded OPM songs that were in English. "They’re English songs recorded by Filipino artists," he said, mentioning artists like Side A.
David also revealed that recording the album took only a few days. He said he was not used to it, but he admired the people he was working with, like Jay Durias and Jimmy Antiporda, for their expertise. "We will record three songs in a day. We will arrange the song on the spot, and record. And that’s one song. It was very fast," he said. Asked to whom he dedicated the album, David did not mention any of his leading ladies in Nandito Ako—Jasmine Curtis Smith and Eula Caballero. "I was thinking more of the fans," he said.